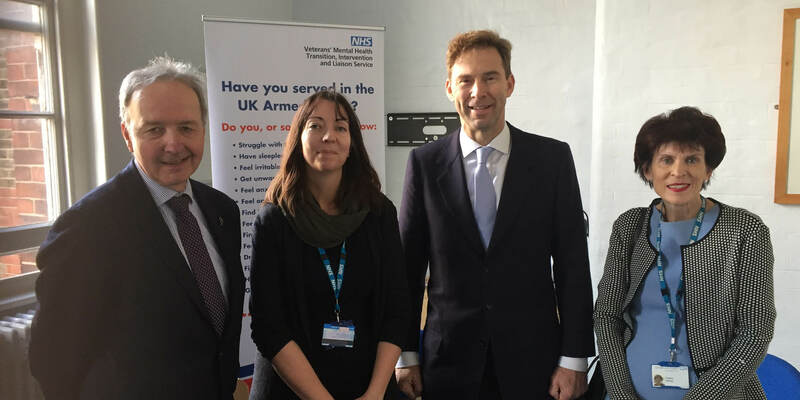 On a special visit to mark Time to Talk Day 2019, Minister for Defence People and Veterans, Tobias Ellwood, MP, heard about the work staff including psychologists are doing to help servicemen and women, many of whom are still suffering trauma - often years after they have left the armed forces. The Trust’s Transition, Intervention and Liaison Service (TILS) sees hundreds of ex-military personnel from across London and the south east every year, treating some and signposting others to alternative, appropriate assistance. They have seen ex-military from conflicts ranging from the Second World War and Korea, through to more recent ones including Iraq and Afghanistan. The programme helps tackle the early signs of mental health difficulties and also includes help with alcohol and drug abuse, along with social support, such as employment, housing and finances.